Unfortunately the rubber tyres on this bandsaw are not capable of being replaced and the wear on the upper wheel after nearly 10 years is considerable. 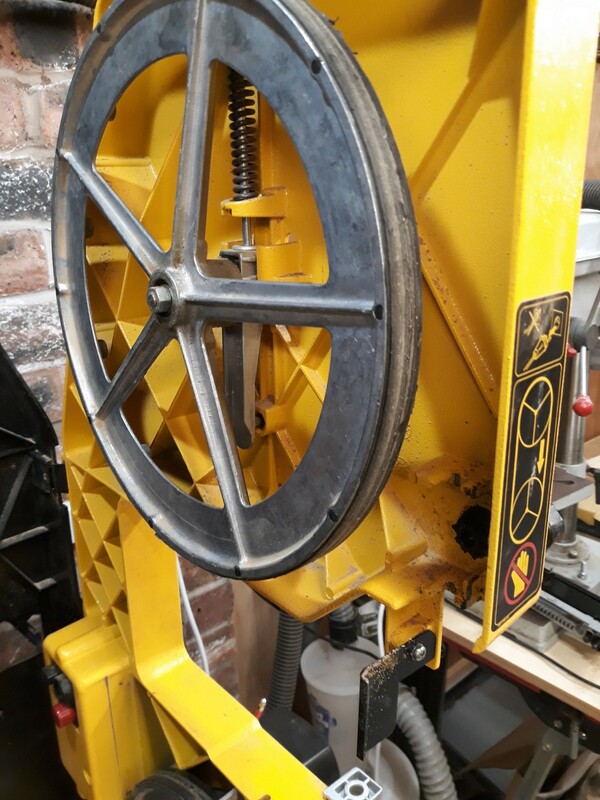 Spare parts are still available (2018) for this machine so I decided to buy a new set of wheels to prolong the life of the bandsaw. The wheels come as a full assembly complete with bearings, new rubber tyres and are a simply bolt off bolt on arrangement. 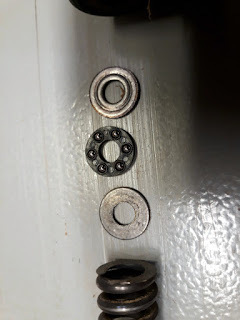 I also bought a new set of rubbing bearings as the old ones had considerable wear. vacuum any residue from previous operations. I also removed the upper rack and pinion assembly complete with bearing assembly. While I was at it I removed the lower bearing assembly. The lower drive wheel removal first of all required the drive belt to be slackened. There is a socket head screw holding the motor in place. Slackening that off enables the tension to be slackened. 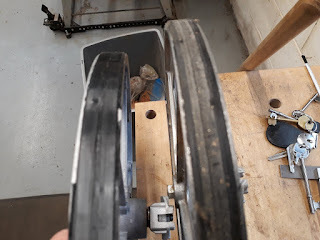 Next there is a nut and washer to be removed from the axle on the enclosure side. 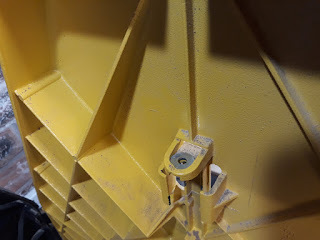 There is a left hand thread holding the shaft to the machine frame. 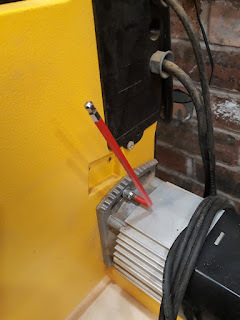 Turning the socket head in the shaft with an allen key loosens the shaft. Ultimately the wheel assembly comes off. The new one is installed with a reversal of the above process. The upper wheel is easy to remove but you do have to be aware of parts that can fall out. 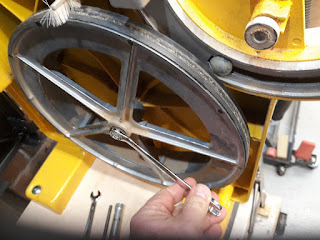 Loosen the tension knob until it disengages from the central screw shaft. There are 2 washers and a thrust bearing at the top that can fall on the floor so be aware. The wheel assembly can then be slid down the guides in the frame. The spring will also come loose. There is another washer under this spring. Remove the central adjustment shaft from the wheel assembly. This is just a square headed coach bolt. As can be seen here the old and new wheels so a radical difference in wear. Assembly is a reverse of disassembly. 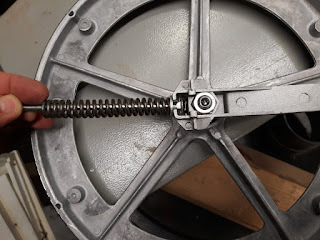 This time you have to carefully place the spring, washers and thrust bearing over the shaft before engaging the nut. 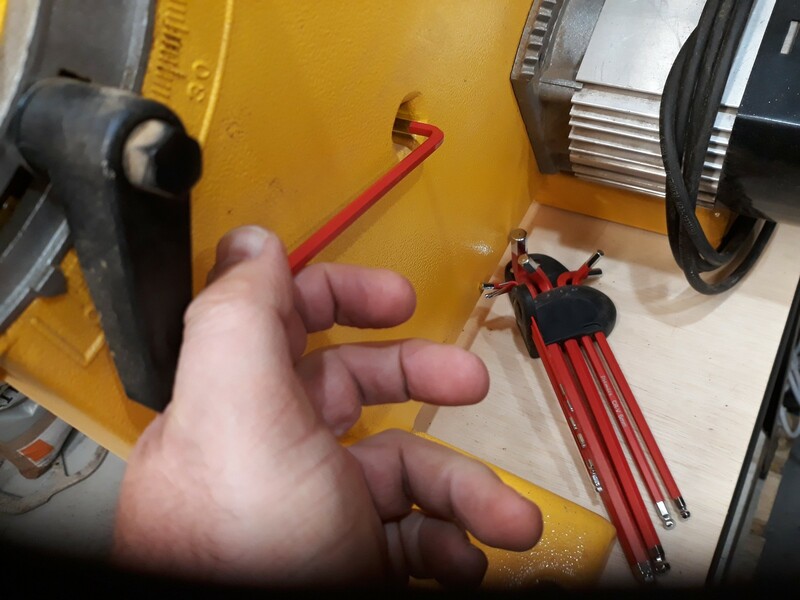 You also have to make sure the square headed coach bolt is engaged and the wheel assembly slid between the guideways on the frame. It is fiddly but with care is easy to do.